The login should now work on the Community forum. For those interested, listen to what the problem was. I spent probably eight hours trying to repair the issue. I finally gave up and had the engineers at my host restore the database from Friday's backup. It's a big database so it took a few hours. It still did not help. I decided to go look at the setting again which I had done at least 50 times. The settings contain about 30 values. One of the values is the URL to the forum. 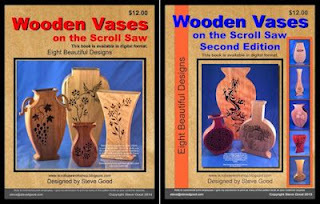 some how it had changed from http://www.stevedgood.com/community/ to http://stevedgood.com./community/. That's right it was missing the "www". Technically you should not need the "www" but in this case the forum software wanted it. Luckily another person had the same problem a few years ago and had written it up in the support forum. To make a long story short "www" cost me about ten hours of work. :) Gotta love these things. 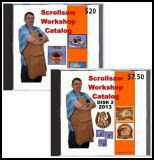 Goal Guy Scroll Saw Pattern. 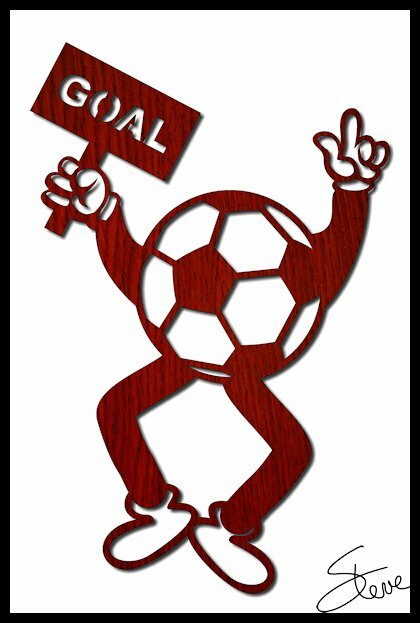 Soccer/Football Goal Guy wall hanging. This guy is over 10 inches tall. If you have a young girl or boy who enjoys soccer/football he or she might like to have this guy hanging on their bedroom wall. 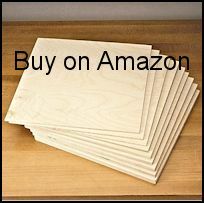 I would cut him from 1/4" thick Baltic Birch plywood and paint to the child's favorite color. Let me rant for a few sentences then apologize. The last month here on the blog has been ridiculous. Just about every other day some technical issue pops up that takes hours to fix. As you can imagine I spend quite a bit of time creating patterns, which I love to do. I also enjoy working with computers so I don't usually mind working the problems that pop up. As long as the problem does not impact my readers too much it's just part of running a relatively large web site. If you run the site as a one man show it just takes time which I now have since I retired. To run this site I have to rely on a few different companies. Google, IPower, SMF, Feedburner, PayPal, SiteLock etc. They are all wonderful companies and my partnership has been great overall. Unfortunately they can all have problems. I try to do my part to keep things backed up and secure. I have to count on them to do their part. I'm capable of mistakes and so are they. The problems have just bunched up in a swarm the last thirty days and I know it has affected many of you. Depending on which parts of the blog you use it has affected you more or less. To make a long story short I want to apologize for the interruptions in service. Unfortunately there is another problem that has reared it's ugly head tonight. The Community forum is down with apparent database corruption. It's 3:45am and I have been trying to restore the database for a few hours with no luck. I am beat. I'll tackle it again tomorrow when I don't feel like blowing it up. In the mean time thanks for your patience.